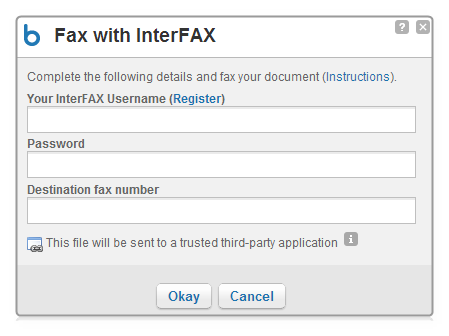 InterFAX enables you to fax your Box documents easily. Box, the leading collaboration platform on the web, offers individual and enterprise users an easy, secure way to organize content online, share content with direct links to files and folders, and much more. 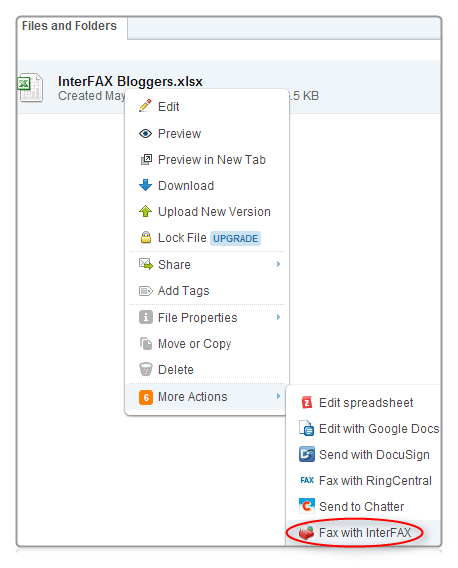 The integrated Box-InterFAX solution lets you first share, access and collaborate documents of any kind from anywhere in the world, and then fax them easily via the Internet, or from wherever you can access Box files. Rather than sending documents to the printer, waiting until your fax machine scans and sends them, and then awaiting approval, the integrated solution is simple and fast: just point to a document, click "Send fax" from Box, and record the recipient’s fax number… InterFAX does the rest. With the integrated solution, Box users not only enjoy greater convenience, but also increase productivity by efficiently conducting all of their faxing activities in a single environment, anytime and anywhere. Learn about our plans and pricing.